It's my turn to post our next project which is actually from as far back as the February issue of Craft Stamper. Life has been so busy for us all one way and another. This is my take on Debbie Dolphin's card gift box project chosen by Jo. I decided to make mine as a birthday card for my CSQ buddy Lesley. 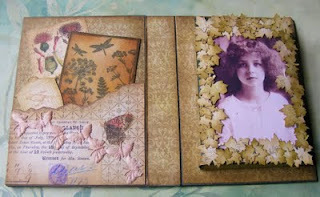 I am afraid I stayed in my comfort zone again with this project, a vintage nature theme! My main colour scheme was green as that is Lesley's favourite colour. 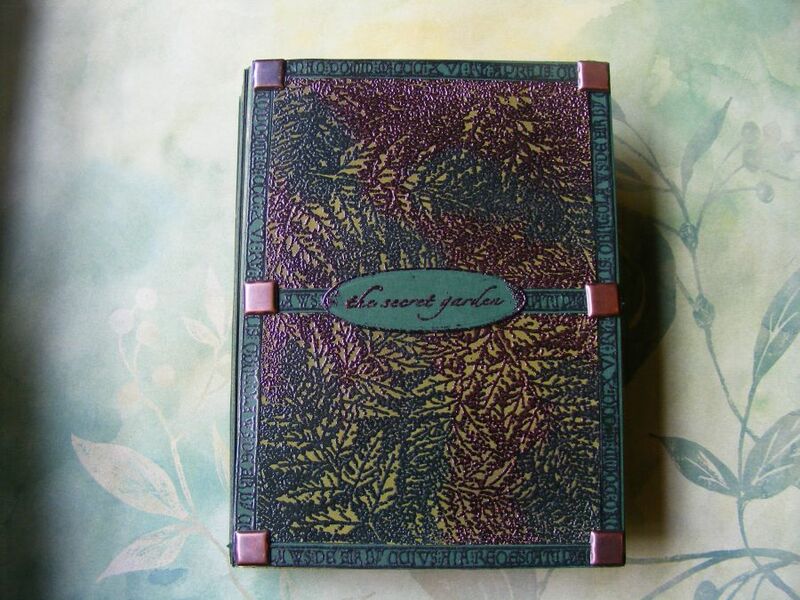 I wanted to make my cover look like a vintage book ﻿and used a combination of stamps and pieced together different pieces of embossed card to do it, using a ton of extra strong DST! I used a large fern background stamp I bought from Rubbernecker at Ally Pally for the main panels, embossed in two colours of my favourite Moonglow Obsidian powders and cut in half. I edged the panels with a border of an ancient letters border stamp from Third Coast. I love their border stamps - they are brilliant value for money too - available from Happy Daze! 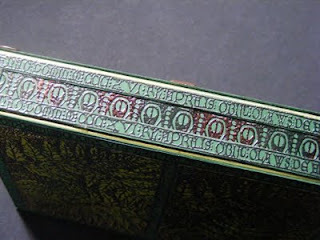 I added large square bronze brads like studs on the book cover. 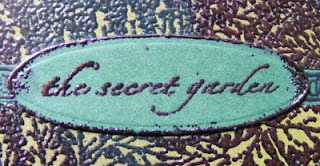 For the book title I stamped some words from a much larger Secret Garden B Line stamp that I adore. For the spine I used another Third Coast border with the letters. The inside uses papers from the lovely 7 Gypsies Conservatory collection, (just rights as Lesley crafts in her conservatory!) with some elements cut out in the pocket and an image stamped from a Crafty Individuals image stamped in Olympia Green Versafine and aged with Vintage Photo DI. I added a little cream guipre butterfly ribbon, again aged with a little VP DI. I decided to add a picture on the gift box section as I planned to put some ribbons and braid in there and I felt it might look a bit messy with all the different colours if I didn't cover it up. I used an image from a vintage postcard that I love. I edged the photo with lots of little leaves cut out of scraps of the 7 Gypsies papers with one of my favourite little Woodware punches, edging each one with a little more DI. Thank you Debbie for such great instructions and inspiration and thanks Jo for choosing the project! Thanks so much for sharing this with us and Lesley is one very lucky lady to be getting such a wonderful project as a gift. Love it!! What a lovely gift Elaine, the colours are beautiful, and the papers are gorgeous. The leaves and butterflies are very pretty. A lot of care and consideration has gone into this gift, that is plain to see, and I am sure that Lesley was so pleased with it. I always love your creations, that's for sure! Elaine, your gift looks like an ancient, rich and exotic treasure. You make a really good job of these vintage books. The ancient writing is a great stamp. I must look out for that one. The inside pages are unmistakeably yours too. You really make those leaves work well. I'm always surprised at how creative you all are interpreting the projects. Lesley is so lucky to own this now. I am the very lucky recipient of this gorgeous piece of crafting. 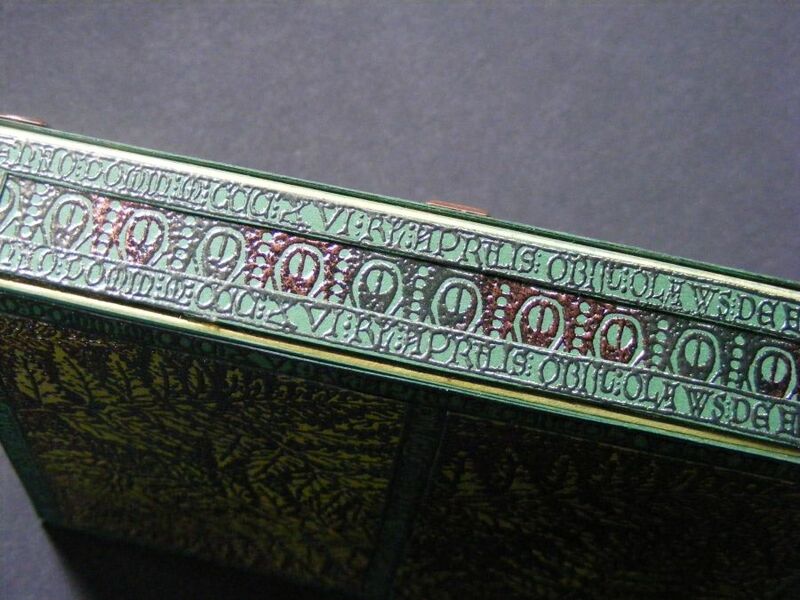 The stamping and embossing on the outer covers is absolutely stunning and so perfectly put together. 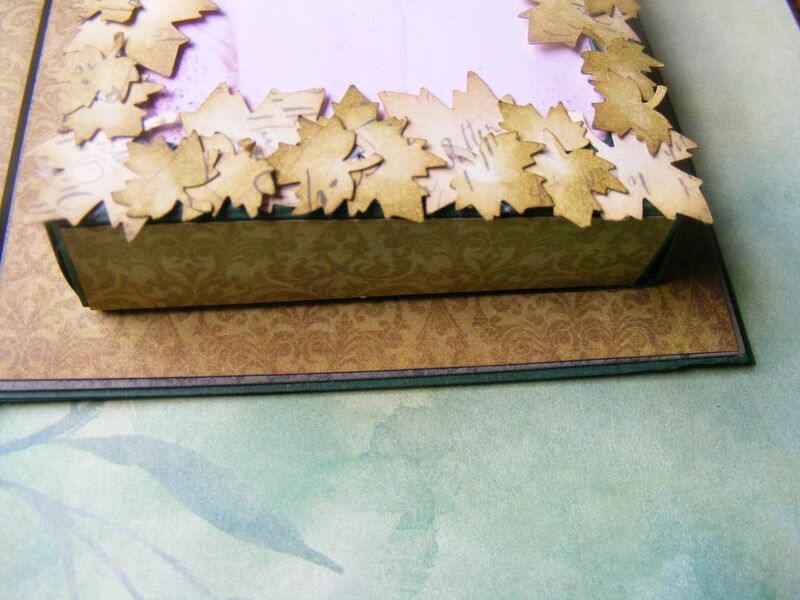 It really does look like a beautiful vintage book, The elements used on the inside are perfect and the vintage image is beautiful and patiently surrounded by pretty inked leaves and to cap it all the box is full of lovely crafting goodies. I really appreciate all the patience and care that has gone into making this project special to me and I shall treasure it. Thank you so much Buddy. Hi Elaine, what a stunning book you've made! 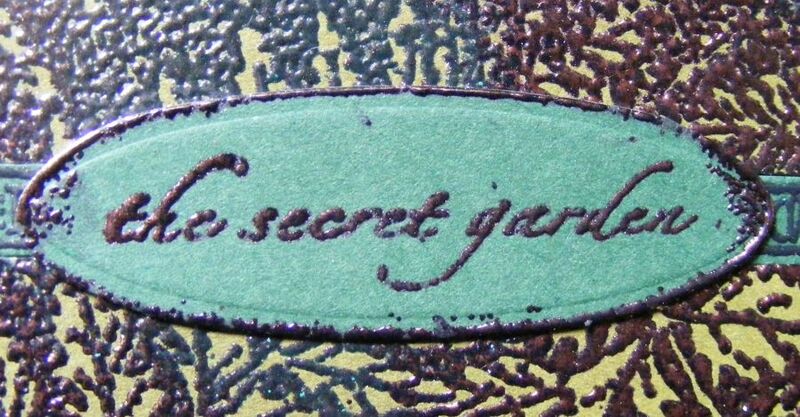 Lesley is so lucky to get that.......When I see the cover, I imagine to open the book and walk in a magical secret garden, such beautiful colours! There is a text stamp from Stampotique which would fit perfect to it. "there is a garden in every childhood, an enchanted place, where colors are brighter, the air softer and the morning more fragrant than ever before"
this is a treasure for sure!! What an amazing piece. Such detail. Must have taken an age to create. certainly gives the feel of a secret garden. Fabulous!! I love it, a wonderful keepsake. Wow! That is totally gorgeous...stunning! !